The Titans received the opening kickoff and handed the ball off to Derrick Henry twice in a row to being the game. Henry, filling in for the injured DeMarco Murray, picked up 9 yards which set up a beautiful 10 yard first down pass to Corey Davis on play action. Marcus Mariota would connect on his next two passes as well, picking up 27 yards targeting his other two receivers - Rishard Mathews and Eric Decker. Henry would gain 13 yards on three straight carries before Mariota would connect with Decker on two of his next 3 pass attempts, leading to a touchdown on their opening drive. Titans lead 7-0 midway through the first quarter. Kansas City would start their drive with an Alex Smith incomplete pass, intended for Tyreek Hill. However, there was a 15 yard roughing the passer penalty on the play, moving the Chiefs to their own 40 yard line. Smith would scramble on the next two plays, picking up 14 yards and moving the offense into Titans territory. Kareem Hunt caught a screen pass for 16 yards before taking two carries for 10 yards, however, the spot was just shy of a first down. With the Titans defense stacking the box, Smith hit fullback Anthony Sherman on a play action swing pass, which Sherman took 20 yards for a Chiefs touchdown. Game is now tied at 7 with 4 minutes left in the first quarter. The rest of the first quarter was all about Henry. He would see 7 touches (1 reception) picking up 24 rushing yards and scoring on a 27 yard reception. Mariota also hooked up with Rishard Matthews and TE Luke Stocker on the drive. Tennessee would take the lead, 14-7, as time expired in the first quarter. The Chiefs wold punt on their next possession, thanks to a Jurrell Casey sack on 2nd down, followed by a dropped pass by Albert Wilson. Tennessee continued to pound the ball with Henry, who saw six more carries on their next drive. Mariota's completion to Decker for 23 yards on 3rd & 12 kept the drive alive. However, the Chiefs defense would stop the Titans in the red zone, forcing a Ryan Succop 21 yard field goal. With 5 minutes remaining in the first half, Titans lead 17-7. 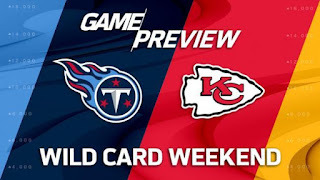 Kareem Hunt would get nine carries on the Chiefs next drive, moving the ball 37 yards and Demarcus Robinson would add a 16 yard reception, but a bad snap on a field goal attempt by Harrison Butker led to a turnover on downs at the Titans 19 yard line. Adoree Jackson defended a 3rd down pass to force the FG try. Titans would go three and out after a 2nd down sack of Mariota by Justin Houston. KC would start the final drive of the half from their own 47, before Butker would knocked down a 53 yard field goal. Hunt saw four straight carries before dropping a 2nd down pass. The next play Smith missed Travis Kelce, to set up the FG attempt. The second half started poorly for the Chiefs as the first play would be called back for holding. Smith and Kelce would connect on a 14 yard completion, but it was still 3 yard short of the first down marker, forcing a punt. Tennessee would also punt on their first possession of the second half, before Kansas City would go three and out, on a drive that started at their own 9 yard line. The Titans started with great field position, KC 43, and took full advantage. Henry would carry the ball four times for 16 yards before Mariota threw his 3rd TD pass of the game, this time to Corey Davis for a 9 yard TD. With 4 minutes remaining in the 3rd quarter, Titans lead Chiefs 24-10. Kansas City's next drive featured a lot of Kareem Hunt, six carries for 26 yards, and a 23 yard completion to Tyreek Hill before the quarter ended with the Chiefs at the Titans 27 yard line. After getting inside the Titans 5 yard line, KC was forced to kick a FG, but Butker missed from 20 yards out. Starting from their own 10 yard line, the Titans would go a quick three and out, as Mariota was sacked again by Houston. With nine and a half minutes remaining in the fourth quarter, the Chiefs would start their next drive right at midfield. Six straight passes and two Hunt rushes from inside the Tennessee 10, lead to a KC touchdown. Chiefs now trail 24-17 with 8:00 remaining in the fourth quarter. Mariota would pick up 40 yards on completions to Davis & Decker, leading to a Ryan Succop 45 yard field goal. Titans now lead by two scores, 27-17, with 5:30 left in the game. Smith would lead the Chiefs down the field, completing six passes, including a 2 yard TD to Kelce on third down. With three minutes remaining, Chiefs trail 27-14. All Kansas City had to do was force a Tennessee punt, but Derrick Henry converted two 3rd & 1's to complete the upset.